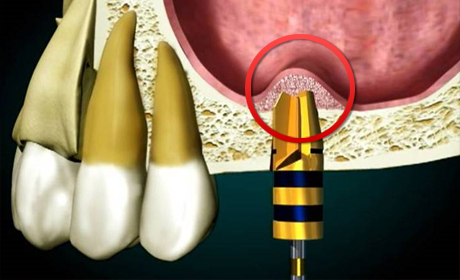 Following the extraction of a tooth the bone that previously supported the tooth (the alveolar bone) resorbs. 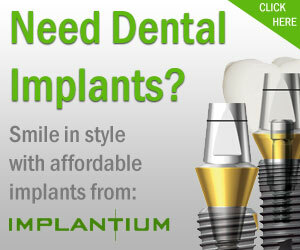 This creates numerous problems for the provision of implants. Also bone loss occurs following infection and the traumatic removal of teeth. The bone loss can be said to be vertical or horizontal. Horizontal bone loss is the hardest to deal with. Over the years numerous techniques have been employed to deal with this problem. The patient’s own bone has been used taking grafts from the hip or the retromolar pads ( the area behind the lower molars) or a core of bone has been taken from the palate for small areas of grafting it can be harvested from the implant site whilst the implant area is being prepared. More recently heat treated cow bone has been used and synthetic bone materials. One example of a synthetic bone material is Osteon. The synthetic material provides a framework like scaffolding for circulating bone cells within the bloodstream to colonise. These cells than become new bone and so over time the scaffolding is replaced with the patient’s own bone. In the case of Osteon the surface of the structure mimics natural biological bone in appearance and it is coated with a substance that actively encourages the bone cells to migrate and stick to the scaffolding. It has a porous structure and different sizes of Osteon are available. Sometimes a mesh is also used to increase the initial stability of the graft this is usually made of titanium and is cut and moulded to the correct size and shape. A membrane is also used. This holds the soft tissues away from the site. Soft tissue cells fill in a space quicker than bone so if it is not prevented from reaching the site bone cannot grow in the area. Bone grafts take several months to mature which often delays implant provision or the loading of the implant. Bone grafting can take place before implant placement or in the case of small areas of bone loss, during implant placement.